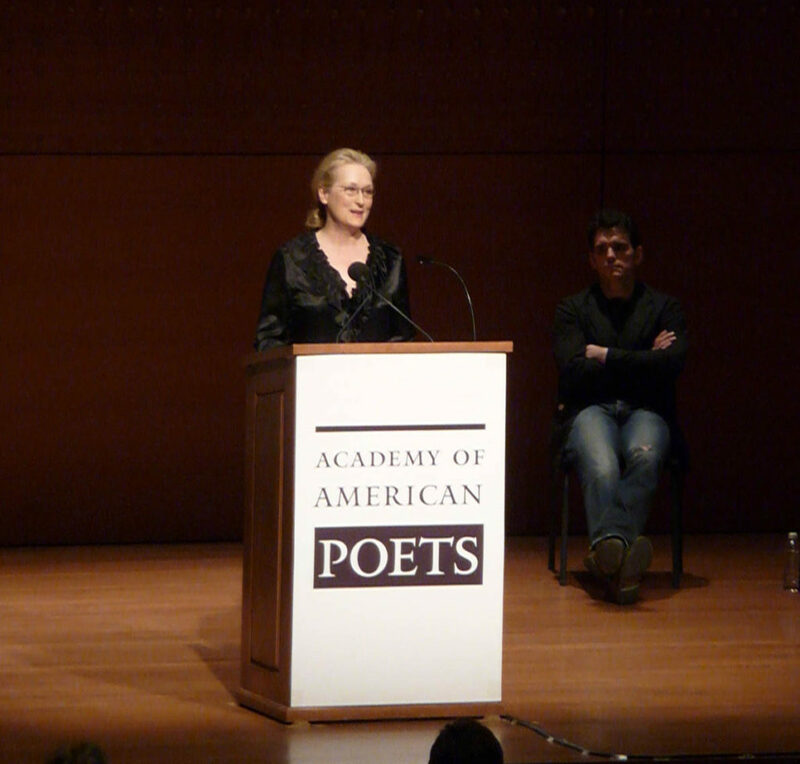 NEW YORK — At an all-star tribute to poetry on Wednesday, Meryl Streep was thinking about her family. Streep, Meg Ryan and Grammy-winning jazz artist Cecile McLorin Salvant were among the readers, and singers, at the 15th annual presentation of Poetry & the Creative Mind. The sold-out event at Avery Fisher Hall was presented by the Academy of American Poets in honor of National Poetry Month. It also featured Amanda Palmer, Maurice Hines and several others reading works by such poets as Frank O’Hara and Nikki Giovanni — and sometimes throwing in a little music. Palmer brought a ukulele on stage and roared the instrument’s praises, while Salvant’s voice was all she needed for a shattering performance of the Bessie Smith song “You Ought to be Ashamed.” Hines was shaking and twitching and nearly started dancing as he read Maya Angelou’s “Ain’t That Bad?” He first heard the poem from Angelou herself when they happened to ride on the same train. I’ve been getting by with poetry by Flo from Progressive. I’ll have to check some of these thespians readings. T.C (et al.)! I’m excited to have remembered my password- however, not nearly as excited as I am to see h&h up and running. It feels like a high school reunion that I hope for my classmates to attend. Thank you so kindly for publishing my poems for years and putting up with me and my myriad…erraticisms otherwise. I see your publications seem to be focused on reviews. Though my work currently takes the shape of something like flash fiction/?? ?, if you’re looking for writers to help contribute with these reviews, please HMU anytime. IDK if you have my e-mail. Reply to this comment or if there’s a PM system, PM me.